If you are looking to replace the ball joint in your vehicle, you do not need to take it into your local mechanic. Instead, you are able to do this on your own. Even if you do not have experience performing such an activity before, it is possible to do so and not have to worry about causing any sort of damage. This is a straight forward process, regardless of the vehicle you are working on. You just need to make sure to always safely support your vehicle on back stands. Never work on the vehicle with only a jack holding up the car. You need to use a socket wrench in order to remove the top bolts. Usually there are four bolts, although it is going to be tightly sealed, so you probably need to have a hammer on hand to bang the socket wrench in order to force it bolts to remove. Now, remove the cotter pin ands slotted nut. Like the top bolts, the general size might vary slightly, so make sure to have all of your socket wrench attachments on hand when performing this sort of work. Once you have removed the cotter pin and slotted nut, you are able to proceed with removing the ball joint. Slide the ball joint out and clean out all of the debris that is around the hole. With the area clean, insert the new ball joint into the upper control arm and make sure the rubber boot does not become pinched in the arm hole. Once in place, bolt the ball joint to the hub and then place the A arm into position. Now, line up the new ball joint and insert the four bolts and the washers you removed at the beginning of the process. 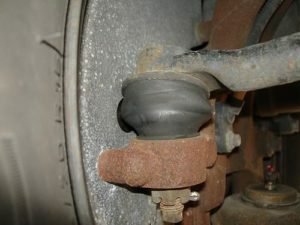 Make sure to tighten these up to 37 pounds per foot as you do not want any chance of this ball joint from coming lose while driving it. Once in place, insert a new cotter pin. The lower ball joint is going to bolt onto different areas than an upper bolt. This is also true with size, as the size of the bolt is going to vary between vehicles. It can be difficult to wrench out the bottom bold, so make sure you have something that is able to move around for easier mobility. Now, remove the underside of the lower ball joint, clean it off and insert the new lower ball joint, then replace the bolt you just removed and tighten it up.